In January, the Graphic History Collective (GHC) launched Remember | Resist | Redraw: A Radical History Poster Project as a year-long artistic intervention in the Canada 150 conversation. Last week we released Poster #12 by Fanny Aishaa, which – to mark the 5th anniversary of Idle No More – looks at INM co-organizer and water defender Melissa Mollen Dupuis. We hope that Remember | Resist | Redraw encourages people to critically examine history in ways that can fuel our radical imaginations and support struggles for radical change in 2017 and beyond. Learn more about how you can support the project on our website, and connect with us on Facebook, Twitter, and Instagram. 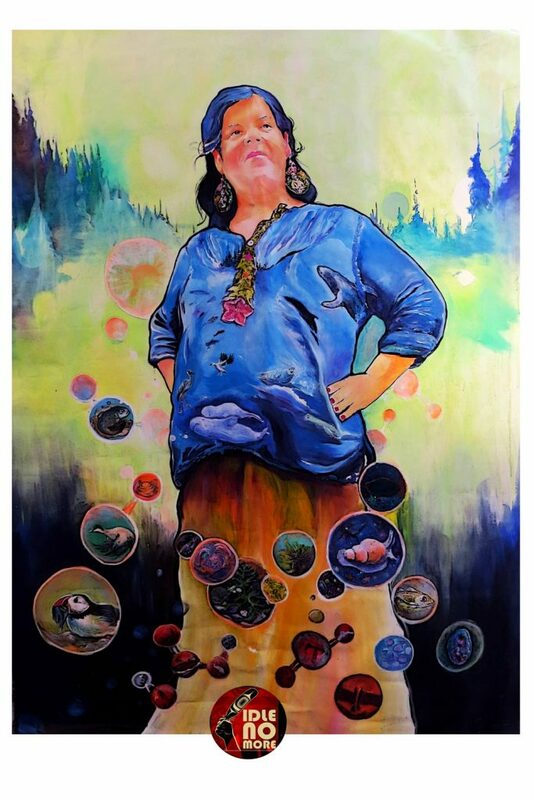 This poster depicts Melissa Mollen Dupuis, an inspiring and proud Innu woman, mother, leader, cultural ambassador, and co-organizer of the Idle No More movement in the area known today as Quebec. The poster is based on a painting that I created during an artist residency called Projet Rioux in the St. Lawrence Estuary (Bic) to reflect on our common relationship to water and the pristine biodiversity inhabiting the great river, estuary, and gulf known today as the St. Lawrence River. The painting portrays Melissa when she was pregnant to show the beauty and responsibility of women as water carriers, life givers, and water protectors. Water protection is a sacred responsibility of all women. Being pregnant shows the continuity of the stewardship of this sacred river (Shipu — “river” in Innu) that connects us from our mothers to daughters. It is also the living heritage, proof, and memory of water being the beginning of humanity, highlighting our responsibility to protect it to ensure it flows freely for the next seven generations. The marine life depicted on the poster signifies our deep interdependence to the health of the water and land. This painting aims to raise awareness about colonial destruction, specifically how capitalist industrialization is harming waters that sustain billions of people and unique species around the world. Canada’s economic expansion over traditional unceded Indigenous territories through fracking, pipeline projects, and increased tanker traffic is putting ecosystems, cultural practices, and identities at risk. Representing marine life alongside an inspiring Indigenous woman on the poster highlights the sacred relationship between Indigenous women, water, and the land but also suggests that violence against the earth, the land, and the water is a form of violence against Indigenous women. Lastly, this poster celebrates Melissa and other water protectors for their resiliency and commitment to healing water and protecting the regeneration of life. It was an honour to paint Melissa Mollen Dupuis. Originally from Ekuanitshit, she is an important voice and cultural ambassador who uses visual arts, animation, video, and storytelling of Nitassinan, traditional Innu territory. Her commitment to and collaborative work with communities and First Nations leaders, organizations, and grassroots initiatives are making a difference in the precious journey of decolonization. As Canada celebrates 150 years of colonialism, I am sharing this poster to give thanks to all land and water defenders and to all of the ways of life that have been here since time immemorial and that have protected the water and land for the well-being of future generations. The poster also gives thanks to all of the people who are on the frontlines, taking action each day to raise awareness, shift paradigms, and protect life for the next seven generations. Fanny “Aïshaa” is a self-taught nomadic visual artist and muralist passionate about the resilience of humans, the richness of communities, and the natural world. All of her experiences seek to celebrate and learn about a diversity of ways of life and practices that can honour life and maintain balance and respectful relationships between all living creatures. See more of her work here. Note: The painting is based on a photo by MADOC. The Kino-nda-niimi Collective, eds. The Winter We Danced: Voices from the Past, the Future, and the Idle No More Movement. Winnipeg, MB: ARP Books, 2014. LaDuke, Winona. The Winona LaDuke Chronicles: Stories from the Front Lines in the Battle for Environmental Justice. Black Point, NS: Fernwood Publishing, 2017. Lambert, Vincent, and Isabelle Miron, eds. J’écris fleuve. Montréal: Leméac, 2015. Nametau Innu. “Territory: Nitassian.” Nametau Innu. http://www.nametauinnu.ca/fr/culture/territoire. Bacon, Joséphine. Bâtons à message / TSHISSINUATSHITAKANA. Montréal: Mémoire d’encrier, 2009. Bacon, Joséphine. A Tea in the Tundra / Nipishapui Nete Mushuat. Translated by Donald Winkler. Markham, ON: Bookland Press, 2017. Battiste, Marie. Decolonizing Education: Nourishing the Learning Spirit. Saskatoon, SK: Purich Publishing Ltd., 2013. Bouchard, Serge. Récits de Mathieu Mestokosho, chasseur innu. Montréal: Les Éditions du Boréal, 2004. Howe, Miles. Debriefing Elsipogtog: The Anatomy of a Struggle. Black Point, NS: Fernwood Publishing, 2015. Jean, Michel, ed. Amun. Montréal: Stanké, 2016. Kanapé Fontaine, Natasha. Assi Manifesto. Toronto: Mawenzi House Publishers, 2016. Kanapé Fontaine, Natasha. Manifeste Assi. Montréal: Mémoire d’encrier, 2014. LaDuke, Winona. Recovering the Sacred: The Power of Naming and Claiming. Cambridge, MA: South End Press, 2005. Marshall, Susan, and Emily Masty, eds. Mind’s Eye: Stories from Whapmagoostui. Oujé-Bougoumou, QC: Aanischaaukamikw Cree Cultural Institute, 2013. Mestokosho, Rita. Née de la pluie et de la terre. Paris: Éditions Bruno Doucey, 2014. Palmater, Pamela. Indigenous Nationhood: Empowering Grassroots Citizens. Black Point, NS: Fernwood Publishing, 2016. Pineault, Éric. Le piège Énergie Est : L’impasse des sables bitumineux. Montréal: Écosociété, 2015. Simpson, Leanne. “Nogojiwanong: The Place at the End of the Rapids.” In Lighting the Eighth Fire: The Liberation, Resurgence, and Protection of Indigenous Nations, edited by Leanne Simpson, 205–12. Winnipeg: Arbeiter Ring Publishing, 2008. Thomas-Muller, Clayton. Life in the City of Dirty Waters. http://lifeinthecityofdirtywater.com. Walia, Harsha. Undoing Border Imperialism. Edinburgh: AK Press, 2013.